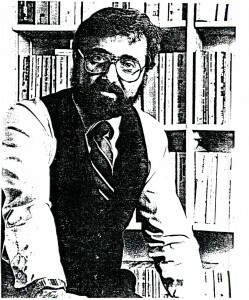 Prudential Associates was founded by former Army Intelligence Officer Robert Miller in 1972, who began serving the local legal community as an investigative, surveillance, and intelligence resource. 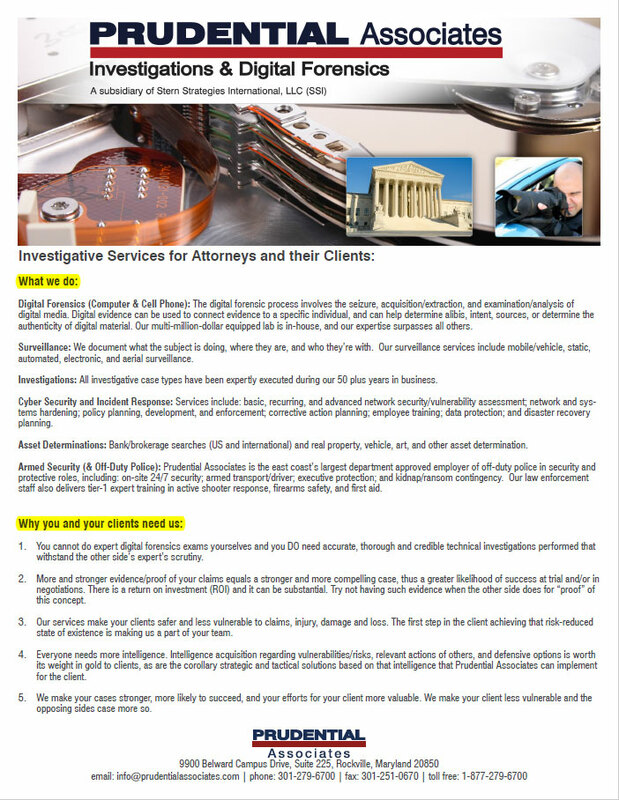 The company quickly developed a reputation as a source to which serious legal professionals could turn for extremely effective and productive intelligence acquisition solutions. Staffed primarily by former intelligence and law enforcement personnel, client law firms found themselves to, in effect, have their own “intelligence agency” in Prudential Associates, including all of the expected and corollary confidential information acquisition resources. Over time, numerous law firms, corporations, and individuals found themselves dependent on the ever-widening breadth of solutions our company was able to provide. As is usually the case when a company delivers consistent excellence, word of our high-quality services spread geographically; from early on Prudential Associates was called on by international clients for services far beyond the boundaries of our local Montgomery County Maryland headquarters. Long before the tragic events of 9/11, Prudential Associates had broadened its service spectrum to include corporate risk management, security consulting, digital forensics, and numerous other ever-broadening lines of service, all founded on the basic concepts of protecting clients and their interests before, during and after a crisis; this is achieved by arming them with intelligence and subject matter expertise relating to threat mitigation, risk assessment, investigative and surveillance information, and numerous other solutions that help secure their interests from physical or other harm. Other solutions include, though are not limited, to the provision of off-duty police officers in security roles, armed teir-1 special operator staff for security in hostile environments (such as those in the middle east and elsewhere), top-secret clearance holding staff for government contract services, undercover investigators in businesses and commercial environments, and subject matter experts for state and federal court proceedings. Since the passing of Robert Miller in early the early 2000’s, Prudential Associates has expanded its service footprint geographically and added over 70 extremely valuable staff members and experts; our consulting and service operations have taken place in thousands of locations on nearly every continent. To date we have achieved recognition as the premier resource for clients in sectors such as: television and movie production; maritime services and shipping; large event/concert planning & security; pharmaceutical production; shipping and logistics; human capital management; and, perhaps most notably, in the legal service industry, given our highly distinguished investigative, surveillance, and digital forensics expertise. Our in-house computer and cell phone forensics lab rivals or exceeds the capabilities of over 90% of the law enforcement labs in the United States, as well as over 99% of those overseas. For a greater insight into our experience, expertise, and operational history, please see our Corporate Resume.